Mr. Fujioka, First of all, I would like to say that I have been following your web site, "Trouts and Seasons of the Mountain Village in Japan - My Best Streams" since you have been making it. I have been making smallstreams.com only a couple of years longer than “Trouts and Seasons…” and smallstreams.com is one of the oldest web sites on fly fishing. That being said, I want to commend you on your longevity. A long time ago, I realized that I really enjoyed your words, pictures and more importantly, the reflection of your experiences fishing in the mountains of Japan. I could read your web site and experience fishing your area through your stories and pictures, I enjoy it very much. I want to personally thank you for making your Internet site. Adam: It seems that in Japan, fishing is very much a part of society. Here in America, fishing is seen as a pass time. Am I accurate in thinking that the Japanese place more importance to the culture than you see in America? I have been to Japan myself and this is my perception, you have been to America as well. Yoshkazu: Because it was said by you, I noticed that I also enjoyed your web page "smallstreams.com" from a long time ago and linked to your web page. And I am happy for you enjoyed my web page from before. The sportfishing population of Japan of recent years is said about 10 million people or 15 million people. I think that became 10% or more of the population of Japan because fishing is one of the healthy recreations that everyone can enjoy in various methods such as the surfside-fishing, the crucian-fishing, the carp-fishing, and the mountain stream fishing. In Japan, there is a proverb "It starts by the crucian-fishing, and it end with the crucian-fishing". It is the following meanings. The person experiences fishing at the nearby river, the pond and etc. in the child age. And the person experiences various fishing, and notices interest as the starting point of fishing and returns to the crucian-fishing at the end again. Isn't this a proverb only in Japan where surroundings are enclosed in the sea and, the river, the pond and etc. exist everywhere? It is said that fishing as the hobby and the amusement starts in Edo period (to 1868 from 1603), became active in the samurai classes such as the daimyou and the hatamoto, and became popular to the tradesman and the woman gradually, and it spread to various places in addition. Though I might not have been adequately answering it because your question is too difficult, I think that by the history of the fishing and a national character etc. of each, the fishing of Japan tends to regard "the spirit and the taste" as important, and the fishing of America tends to regard "the game and the rule" as important. Adam: The computer is my way of exploring places conveniently. I enjoy books as well but it is the computer and the Internet that allows me to understand my interest in other areas of the world. Yoshikazu: Of course, I use the internet to explore the American fly fishing experience. I collect fishing information on the internet before, ask for the guide, and have gone fishing to Yellowstone National Park with my friend. I am exchanging information by the internet with the sport fishers in the world. And I actually went to trout-fishing with many overseas friends who visited Japan. Adam: Our societies are so much different. America as a country is quite young. Yoshikazu: I think that the most different matter is the rule and the system of fishing. The fishing regulation of Japan is basically made for the fishers but not the sport fishers. The fishermen's cooperative association has the fishing rights of each river in Japan, and the fishing regulation is being established by the fishermen's cooperative association. So it is necessary that we buy each license of each river. It is very hard for the foreigner who tries to fish in Japan. Moreover, the fishing regulation in detail is not provided like America, and it cannot necessarily be said that the regulation is observed well. 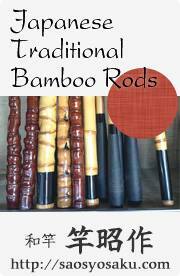 I think that it originates in the history of the fishing of our country. Adam: Yoshikazu, my Mother gave me her LC-3 Macintosh computer in 1994 and I began to make fly fishing web sites after learning how the Internet worked. Back then, there was AOL and very little outside internet resources on fly fishing. Yoshikazu: I opened my web page in 1997. At that time, I have designed and planned the display and the commercial spaces. So I used the personal computer of the Windows OS that the specialist of the companion of work had assembled for me because I was planning to make the web page for the commercial space under the plan at that time. Now, I have forgotten the specs, but I think that it was the personal computer of considerably high specs at that time. The age that the individual web page was rare, the internet resource concerning fly fishing and tenkara fishing was really little as you were said. Adam: When I embark on a particular interest, I usually do it alone however, I try to surround myself with the best people I can find. I listen and learn, practice, participate ask questions and apply that to my own practice. Often times, I wish that I had started a club with regional chapters that served also as an online club for small stream enthusiasts. I understand that you have started a fishing club yourself. Yoshikazu: To enjoy nature altogether, we started the fishing club "TSUTTENKAI". 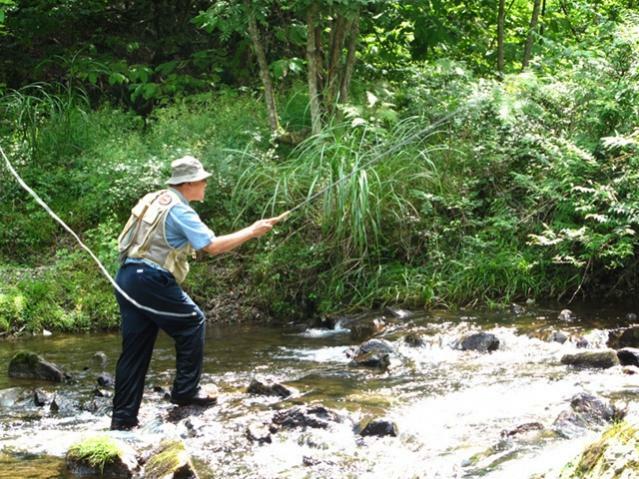 The fishing methods of the club members are various respectively, but it is common that we love the mountain streams. Tying Kebari, repairing tackle and searching the destination, it can be said that all concerning fishing are the enjoyments of fishing. Moreover, to enjoys things of nature, to tasting the mountain products and local sake, to touch humane feelings and the history of the mountain village, etc. I think that there is the true enjoyment around fishing. I also think drawing the picture of the trout, the mountain village and etc. to be the enjoyment related to fishing for me. 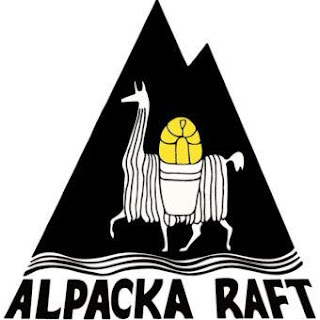 Adam: Every year or so, I attend a local fly fishing club meeting to see what I am missing. There talk about a lot of trips to the mountains to camp and fish and traveling to other areas. I like the idea of companionship in my practice, but I am best at home, alone on a stream. The times I have organized stream side meetings, we all split up and fished alone and meet far up the mountain valley under the cool shade of a pine tree. Often there was a cigarette or a bottle of spirits involved. Many times I found myself looking for a place to take a nap in the cool grass. That evening, we would meet at a common area to camp together. Yoshikazu: I go fishing with friends whom the schedule suits during the fishing season several times and go also to biannual regular fishing trip of Fishing club TSUTTENKAI. Of course, I go fishing to "my best streams" by myself. However, fishing is always only a name, and it is a pattern mostly that after we fishes a little, we drink sake and takes a nap under the shadow of a tree of the stream side. Adam: Recently, I have started to put together an light weight back packing kit so that I am not weighed down when I am hiking on stream. Tenkara is perfect for steep mountain valley streams and easily fits into a small back pack. The simplicity of fishing tenkara style is attractive to back packing. Yoshikazu: I hiked and camped to often go fishing when I was young. 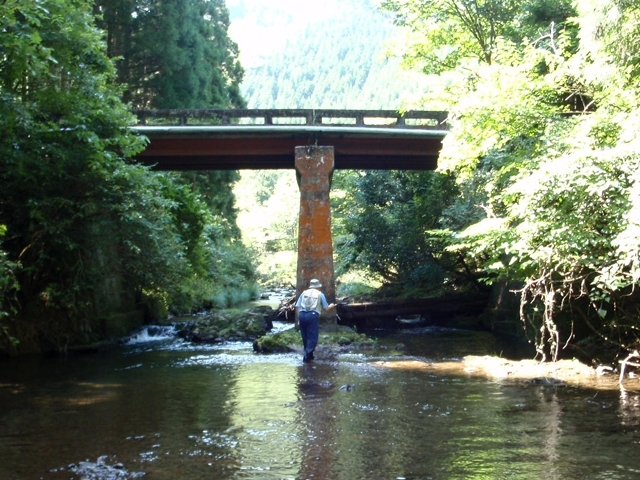 But I enjoy fly fishing or tenkara fishing in the stream that is not too steep because it aged now. Really, the simplicity of Tenkara is the best for the backpack. Recently, I was asked guidance of Tenkara-fishing to British friend who are making hiking a hobby, so we went fishing together last year, and we will also go fishing together this year. 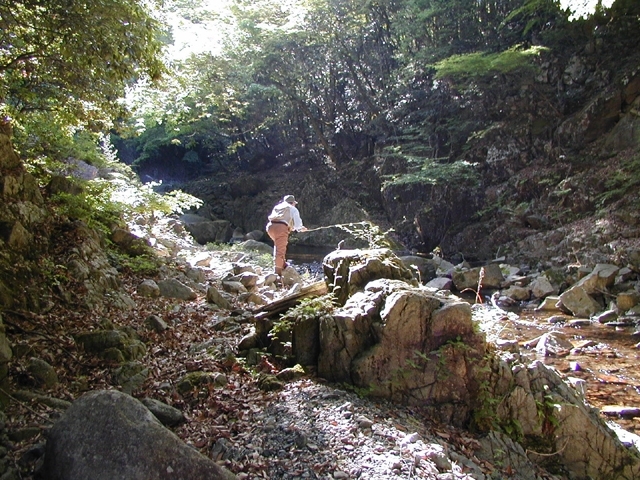 His desire is to carry Tenkara tackle easily, and to add a enjoyment to hiking. Adam: Tenkara is relatively new in the United States. 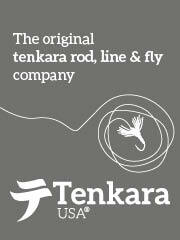 There is Daniel san and his company, Tenkara USA and that is it. The rest of our equipment has to be imported. 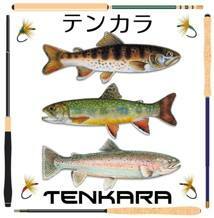 I have spent a lot of time researching the Internet for choices in tenkara equipment. Yoshikazu: In Tenkara, furled tapered line is called "Basu". It is because horse's tail was used at old days. Tippet is "Harisu". (It was called "Tegusu" at old days.) Fly is "Kebari". Landing net is "Tamo". Creel is "Biku". All of Line and Tippet and Fly is called "Shikake". The spool to hold them well is called "Shikake-maki". Adam: There are many ways to look at tenkara, I have heard it called, “ten colors” and I do enjoy that. Here in America, there seem to be two camps as well, tapered and level line. Yoshikazu: It is someone's joke though “ten colors" is admirably aptly put expressed. No one knows for certain why it's called tenkara. I use the furled tapered line because I often fish in the small stream. As for the use of the level line, it seems to be more suitable to fish the large stream. Adam: I fly fish with a reel and also tenkara. I use tenkara in small streams. Yoshikazu: I am also the same as you, and do fly fishing of the western style. When I want to enjoy fishing readily, or want to fish in the small stream, I use Tenkara. Adam: Thank you very much for your time Yoshikazu, I really appreciate your agreeing to this interview. 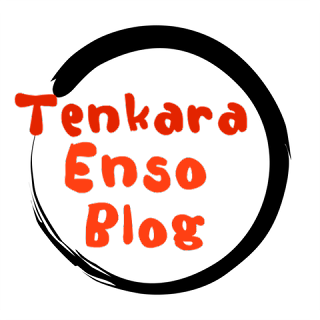 Yoshikazu: I think that it has died down a little now though there was time when Tenkara fishing stole the limelight in the past. I think that I can say so according to the amount of issues of the book and the magazine related to Tenkara fishing now. However, because the merit of Tenkara is being admitted in foreigner recently, I am very glad. I think that I want many people to taste simplicity and fun of Tenkara fishing.